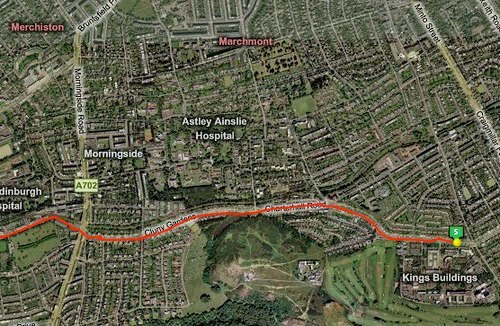 When the 20mph Limit Pilot in South Central Edinburgh was up for consultation, at one point it looked like the streets people actually need to use and cross to get anywhere in this city (such as Marchmont Road or Grange Road) would be included as well as quiet residential backwaters. Lothian and Borders Police appear to bear much of the responsibility for undermining political leadership here by refusing to uphold the law [Kim Harding has some good backstory from nearer the time], but the other influential objector who managed to derail this important aspect of the pilot was our very own (publicly-owned) Lothian Buses. Their argument didn’t really hinge around safety or liveability concerns, but simply the impact that a 20mph limit would allegedly have on their timetable and business. (The obvious point that a bus service becomes even more attractive when car traffic is slowed down seemed to escape notice). However, as a semi-regular bus user, this attack confused me. 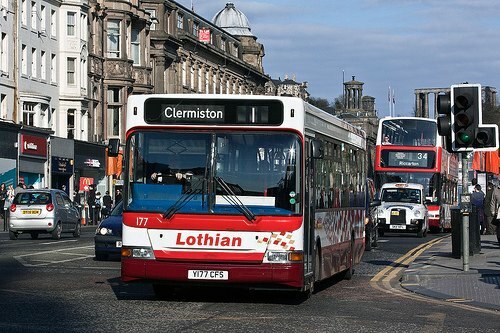 The public’s experience of being on 90% of Lothian Buses is one of moving very slowly. Do their vehicles really travel so far above 20mph that there would be a serious impact on timetabling if the limit was brought down? When I read that in some other parts of the UK, bus services are taking a leading role in road safety by voluntarily driving at less than the maximum legal limit, my suspicions grew stronger. Surely such a scheme would be stillborn if it put them heavily out of pocket? I decided to measure exactly what the impact of a 20mph zone would be on this bus service using GPS technology and computer analysis. 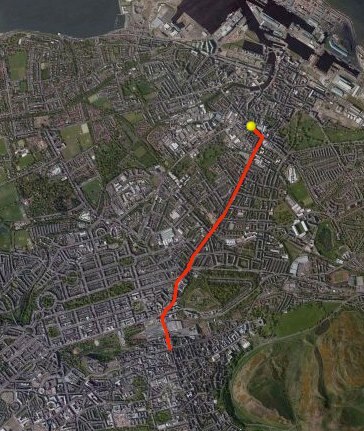 Based on that GPS trace, should a 20mph limit have been put in place all the way from Cameron Toll to Slateford it would still only have “cost” the number 38 a paltry 24 seconds. Since much of the journey was spent at red lights, it’s likely that the bus would have spent most of that 24 seconds getting to the back of queues later and spent 24 seconds less waiting at them. As only 1300m of the number 38’s route would actually have been affected by the South Central 20mph pilot, the actual ‘threat’ to the route was a trivial 7 seconds – about how long it takes for an extra passenger to board at just one stop. Nevertheless, the South Central 20mph Pilot was duly watered down and very few meaningful roads were included (West Saville Terrace and Ratcliffe Terrace are the only ones that spring to mind. Indications are that around 50% of vehicles now travel at 20-25mph, which is extremely positive for a speed limit zone that was almost free to install on 30 miles of urban roads, and is never enforced). Proposals for the regeneration of Leith Walk noticeably failed to build in any significant improvements to the pedestrian or active travel experience, not least because they maintain the “Walk” as a 30mph four lane expressway (it has been proposed, half-seriously, that we rename it to “Leith Drive”). Today I had the opportunity to instrument another Lothian Buses service, again at around 7pm after the end of the evening rush. This time it was the turn of service number 7, which I monitored for the length of Great Junction St, Leith Walk and up onto North Bridge. So, from Great Junction St to the Royal Mile, outside of rush hour when traffic is flowing pretty freely, a 20mph limit would cost Lothian Buses something on the order of 9 seconds. I suppose two extra people getting on at a stop would add up to just about the same amount? Of course, again the bus spent much longer than 9 seconds waiting at red lights (it was stationary for 5 minutes and on the move for 7min 38s – although much of that is setting down at stops). If the council ever dare to consult on a 20mph limit on Leith Drive Walk, I certainly can’t see any reason for Lothian Buses to complain. In fact, last summer Cllr Eric Barry helped me to establish, extrapolating these results using his own figures, that a citywide 20mph zone might increase required bus capacity by as little as 0.05% (for more backstory on this, see CityCyclingEdinburgh). 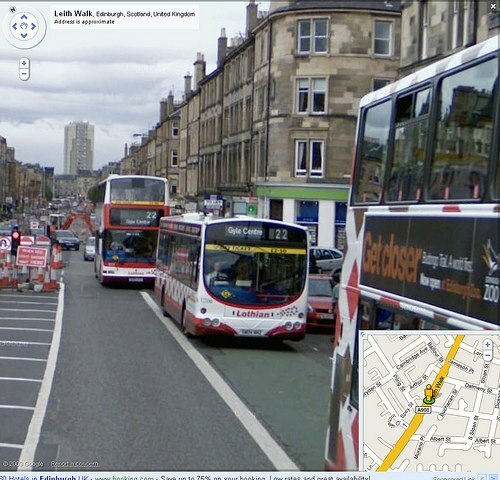 Let’s not go crazy here, but there’s certainly little reason to believe that making Leith Walk more pedestrian and cyclist-friendly would impact the city’s public transport provision in any significant way. If anyone has GPX traces of city bus journeys they’d be happy to share, I’d love to run the same analyses – drop me a comment! 2. South Edinburgh 20mph area – the council promised a full review after a period of operation – can’t remember when, possibly 18 months or 2 years?? Your evidence will be very useful for that. 3. Are you on twitter? I’m known for cycling instead of riding the bus because of the reduced time it takes, but I’m all for a bit of statistical data gathering. Might be worth re-posting the link to the current 20mph zone to identify all the bus routes that pass through it. Very interesting post and a useful post for those of us who may engage in simliar campaigns in the future. The use of the GPS was a great idea. Thanks for sharing. @Dave – thanks for the link. I attempted to tweet my thanks too (to answer your third question: it’s @david_mccraw). 1 – a pity you didn’t get the chance to present your researches to the Council – perhaps you could write to them now pointing out the weakness of their decision-making and asking them to review their decision. 2 – in certain levels of motor traffic a slower speed limit will actually reduce journey times by smoothing the flow – as happens on motorways when they introduce a 50mph limit for example. There will be both theoretical (mathematical) and real-life evidence to support this. This means that though ‘attained speeds’ go down while ‘average speeds’ go up. 3 – Slower ‘attained’ speeds reduce the need for expensive acceleration (which demands lots of fuel) and reduces maintenance costs, so all in all the bus company could well find itself saving money with the 20mph limit. Dave – would be good to see the travel speed data graphed, no doubt it conforms to some sort of bell shaped curve! So… Lothian is a place?? After decades of wondering what the heck Fish was talking about when singing “I was born with the heart of Lothian” in Marillion’s “Misplaced Childhood” album, it turns out it wasn’t some arcane world from a drug-induced trip. On the other hand, having been an ignorant all these years without bothering to look it up in the dictionary speak volumes about my laziness.